Today we're excited to share one of the fall pumpkin decorating projects we've taken on this season — making live planters out of carved pumpkins! Image pinned from Jonna and the original project idea can be found here, at Better Homes and Gardens (3rd image in the slideshow). 1. Image pinned from Lisa and the original project idea can be fond here, on Martha Stewart (#61 in slideshow). 2. 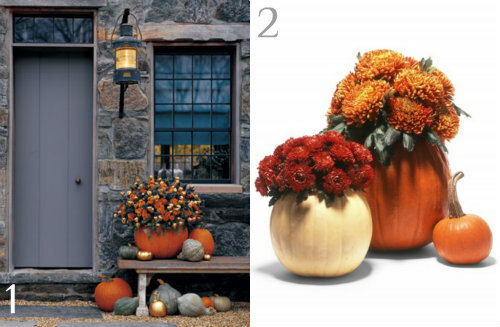 While flipping around in that same Martha Stewart slideshow, I came across this related image (#40 in slideshow) and pinned it for this project too. 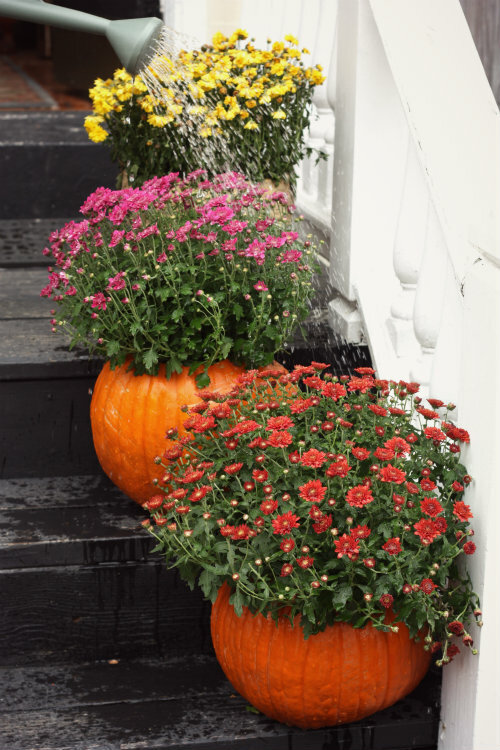 We'd already gotten our pumpkins this year and had a few bright yellow mums in the planters we snagged at a neighborhood yard sale earlier this month all hanging out on our front stairs to "fall" things up a bit. Guess who can't stand it when we go out front to take photos and he isn't allowed to follow? 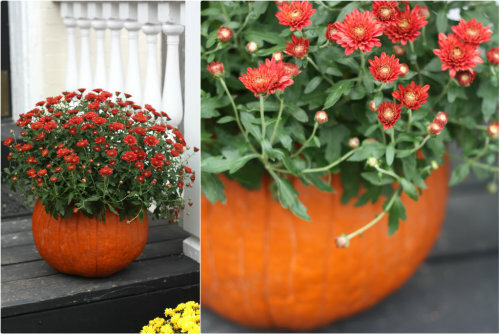 While we loved the autumn look the plants and pumpkins were bringing to the front of the house, we definitely wanted to take it up a notch with the pumpkin planter idea, so we picked up 2 more colorful mum plants and brought the pumpkins inside to get started! 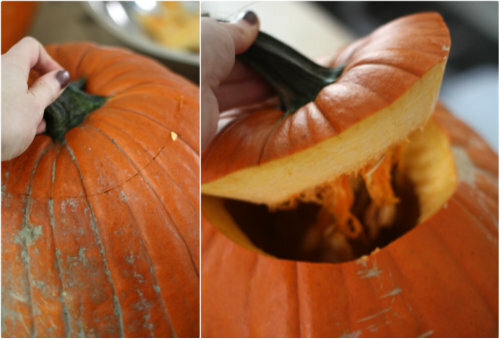 After wiping the excess dirt off the pumpkins, I just carefully cut a wide circle around the top edge of the pumpkin and removed the top. 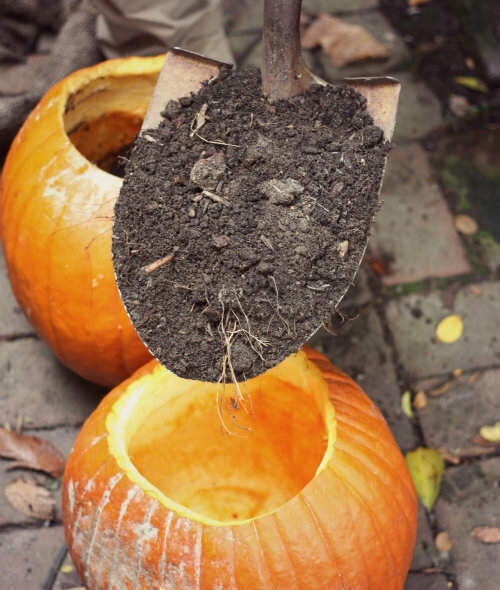 I cut wider than with a regular jack-o-lantern since we'd be putting live plants in the pumpkin and I wanted lots of room to add fill dirt and let those plants get happy in their new home. I set the smallest of the 3 pumpkins aside to tackle for our jack-o-lantern (details coming tomorrow) and started roughly scooping out all the seeds and other insides from the larger 2 we'd be making the planters out of. 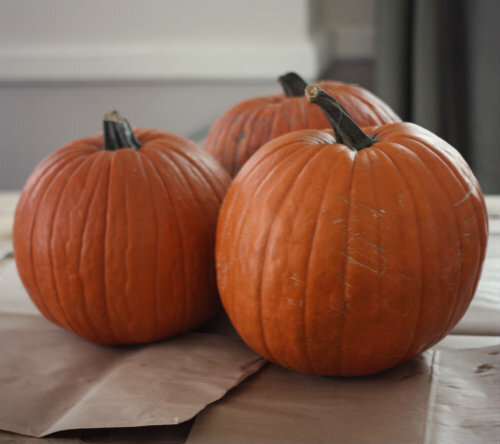 Side Note: We always like to save the seeds from pumpkin carving to make and enjoy roasted pumpkin seeds the last week of October — it's such a fun tradition. We use this recipe and method for roasting them. 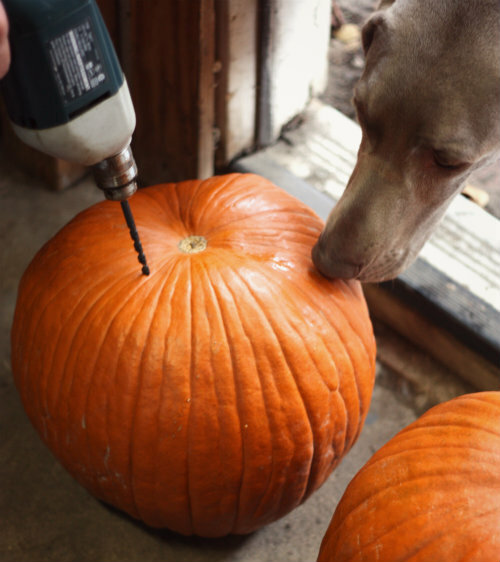 I didn't worry too much about scraping the insides of the pumpkin perfectly since they wouldn't be carved further and we'd be filling them with dirt. So after removing the tops and a quick clean of the insides, we were ready to bring these guys outside to get them planted. With a quick wipe down and healthy watering, we were ready to call our planters complete! 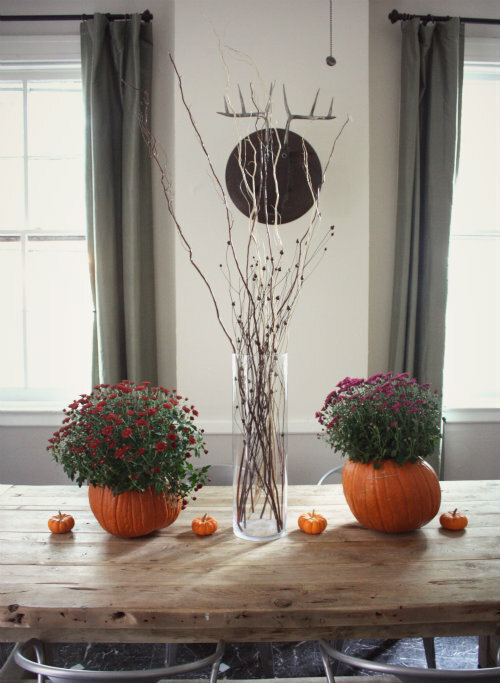 I just brought the tall glass cylinder vase full of branches we keep in our front entry back to the middle of the dining table and placed each pumpkin planter on either side of it. 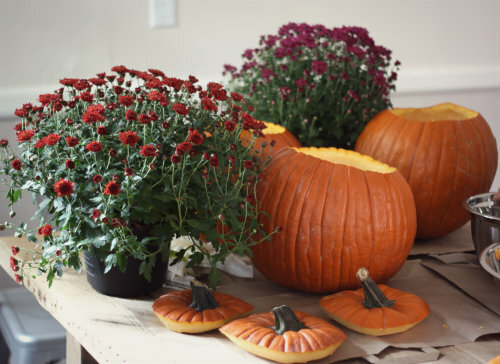 Then I brought all those little baby pumpkins we had around the house back there to toss in the mix too! 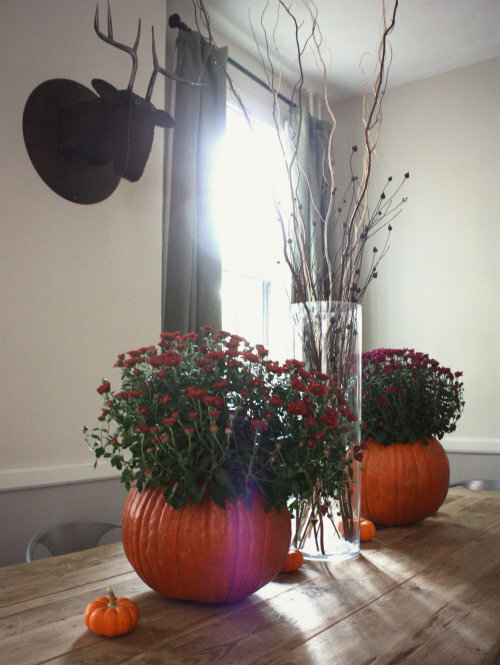 We thought a big statement centerpiece like this could make for a fun party table throughout the fall into Thanksgiving. Holy moly I LOVE those!! They make a fantastic centerpiece. I love how these turned out. I had this pinned but never got around to it. 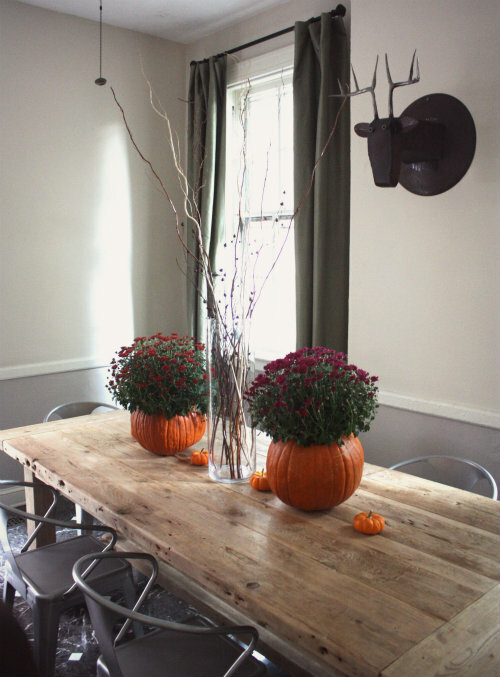 Love your table and chairs also!! Thanks so much! We've had a lot of fun trying to figure this room out! 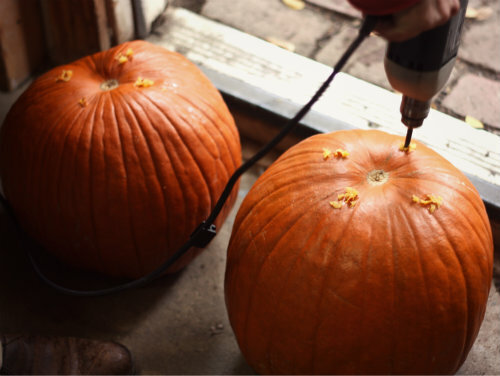 All proper pumpkin carving must involve power tools. I think that should be a rule written somewhere. Nice job! Hahaha, thanks Sarah! 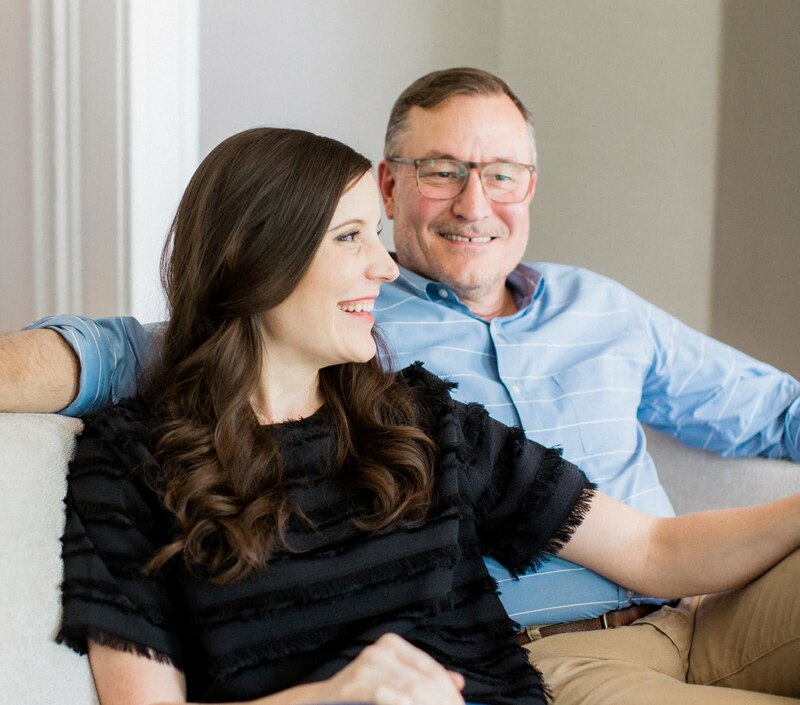 We're thrilled to have found your blog and be following along now! Oh wow, I love these! I always feel like I'm wasting my pumpkins...not displaying them like I should. This looks really great! I would LOVE for you to link this up at my Ginger Jamboree Link Party!! Thanks Megan, can't wait to check it out! Thanks so much Tamsyn — we are pretty smitten with that furry little fellow! Such a great idea. 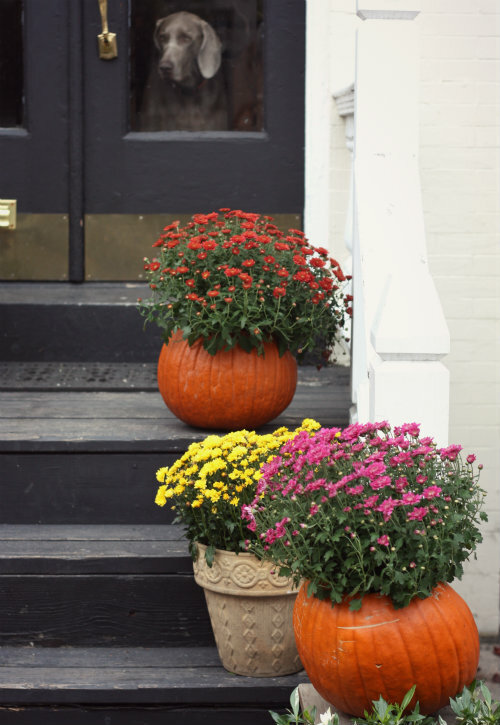 I love how it looks on your front steps! 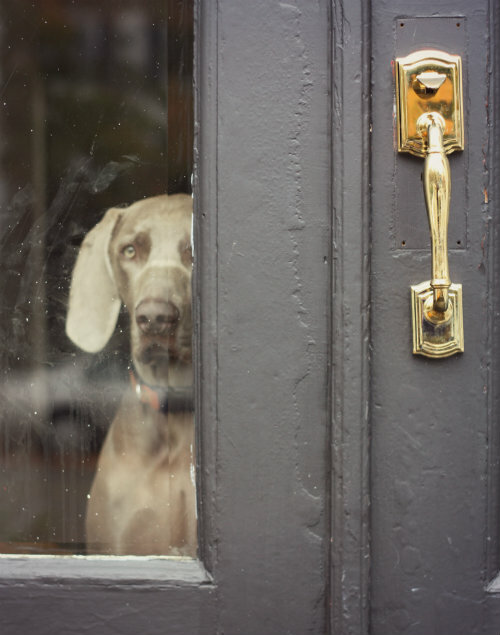 And the dog checking everything out through the window is pretty adorable too! Haha, thanks so much! He is definitely our curious little fella! That is too funny Detta — what a small world! We love you even more too knowing you have the same deer sculpture, haha! This is such a cute idea! 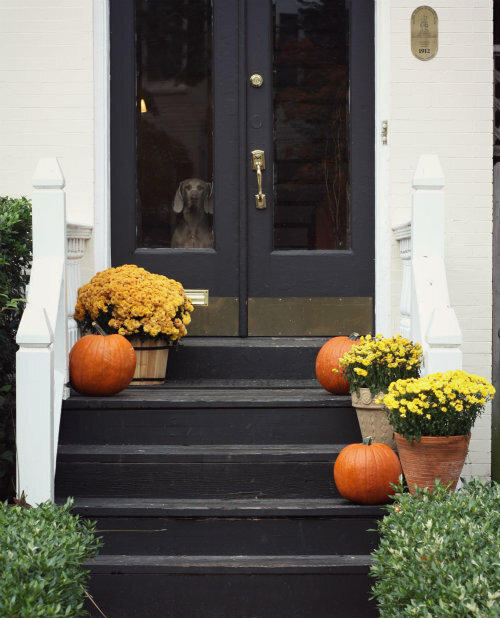 How long did the pumpkins last? Hey Randy! 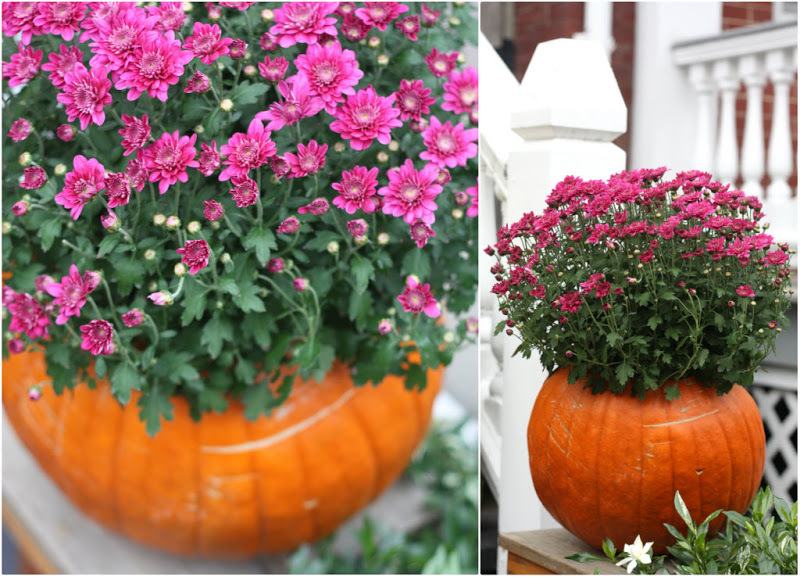 Thanks so much — they lasted a good 3-4 weeks after carving on our front stoop! 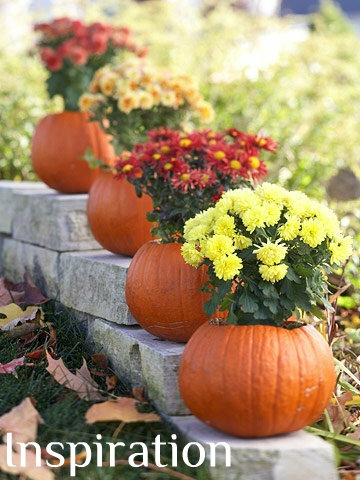 Do you re-pot the plants once the pumpkins start rotting or just throw them both in the mulch pile? How much room do you need to start a mulch pile and do you get lots of rodents with that pile? 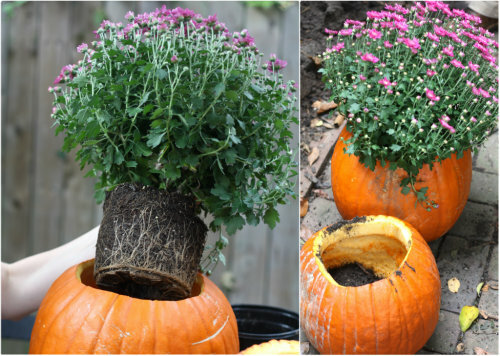 I did this in a HUGE planter we have in the front yard last year. 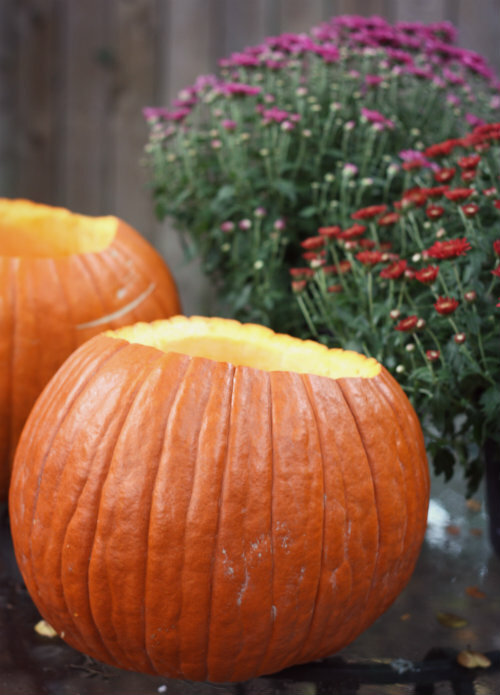 THIS year, we noticed a pumpkin plant growing and, after looking at your site, I realized that there must have been seeds left behind from last years pumpkin display. I moved this years' plant to the raised garden bed in the back of the house, and it has two pumpkins growing on it so far. Love your site! Wonderful news! Thanks for the kind words!